A Paris-based independent communications agency Gloryparis is getting some global traction for a cheeky yet bold marketing stunt for its recently launched communications boutique. 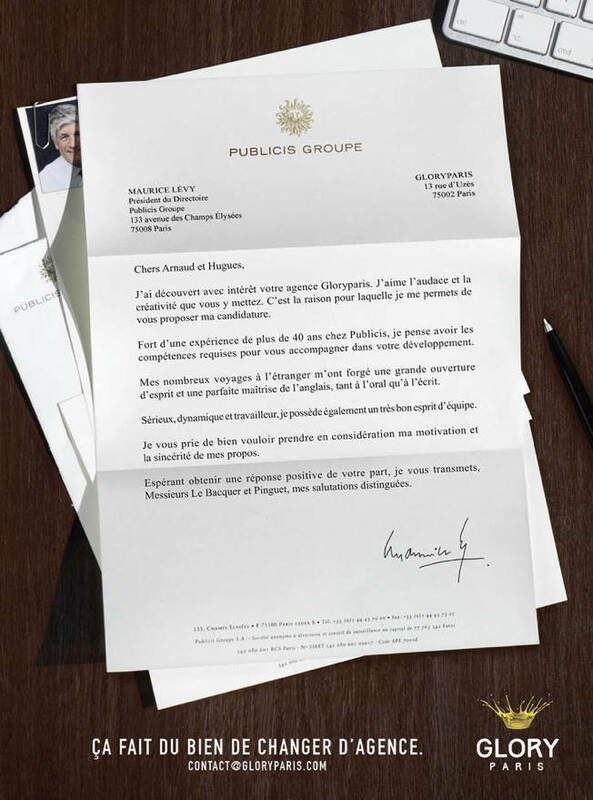 The agency recently released a print ad of a fake cover letter from real life Madmen Maurice Lévy, CEO of Publicis, applying for a position at the indie outfit. The ‘letter’ bears Publicis’ stationery and logo, and is also appended with Gloryparis’ contact details at the bottom, for added irony. It is with interest that I discovered your agency Gloryparis. I admire the audacity and the creativity that you have displayed. For this reason, I would like to appeal my candidature. With over 40 years of valuable experience at Publicis, I think I have the skills required to support you in your development. Through my many trips abroad, I have forged an open-minded nature and acquired a perfect command of English, both spoken and written. Serious, dynamic and hardworking, I possess very good team spirit. I beg of you to consider the motivation and sincerity of my proposal. I hope to receive a positive response on your end, I leave you, Mr Le Bacquer and Mr Pinguet, my distinguished salutations. Gloryparis was founded by Arnaud Le Bacquer and Hugues Pinguet. With over 15 years of experience, Le Bacquer worked at CLM BBDO, Leo Burnett, Publicis Conseil, Agence H (Les Gaulois). Meanwhile, Pinguet has experience as a creative director in network agencies such as Bates, DDB and Havas 360 as well as an independent firm, of which he was a partner and vice president. What does Publicis have to say about this? We will keep you posted! Hong Kong's top English newspaper drops its paywall for readers looking for news and information about the student protests that h.. The two new tools are “Restaurant Home” and “Marketer”, providing data analytics and marketing insights to improve restaurants' bu..